A 33-year-old woman fatally shot by a stray bullet while sitting in an Uber in East Los Angeles was identified Sunday by the coroner’s office. Deputies sent to Union Pacific Avenue near Bonnie Beach Place at 10:15 p.m. Wednesday found Yuri Chavez Arellano suffering from a head wound, according to the sheriff’s department and the coroner’s office. Arellano died at a hospital. Arellano was riding in a vehicle with an Uber decal on the window, but it was unclear if the vehicle was in service at the time of the shooting, authorities said. 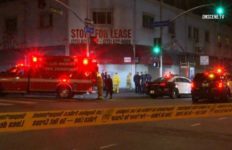 Anyone with information on the shooting was asked to call the Sheriff’s Homicide Bureau at (323) 890-5500, or Crime Stoppers at (800) 222-TIPS.